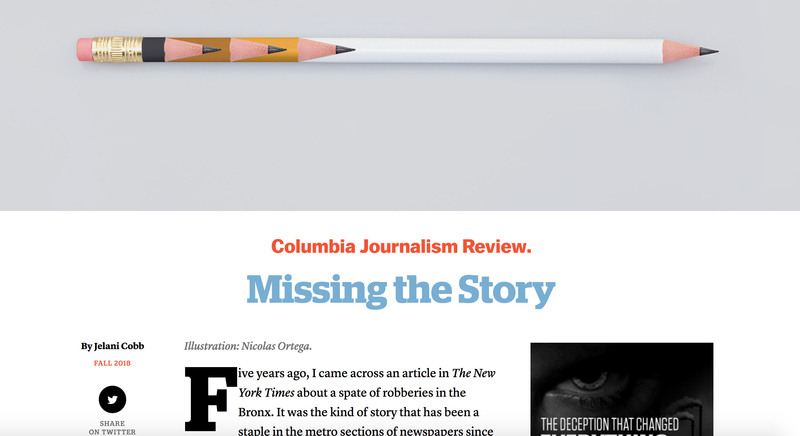 Columbia Journalism Review is focusing on diversity in this fall’s print issue and online site— not the diversity of inclusion or the diversity that just gives us more voices. In the intro to the Fall 2018 issue,author Jelani Cobb, director of Columbia University’s Ira A. Lipman Center for Journalism and Human Rights, says now it’s more than that. She shows how journalists are just plain missing the story. Thus, diverse newsrooms not only are the logical and right goal – they’re also the ethical and civic-minded one. And that’s true for scholastic media newsrooms, too. First a little background. The American Society of News Editors began assessing the situation in the late ‘70s after the Kerner Reportin the late 1968 explored some of the causes of race riots, discovering, among other things, the lack of diversity in media. ASNE began conducting a national newsroom employment census, getting the industry to focus on parity by 2000. That didn’t happen. The numbers have inched up, but now, 50 years later, they still don’t reflect growing national diversity. Jack Nelson’s “Captive Voices: The Report of the Commission of Inquiry into High School Journalism”also showed in 1974 that, in addition to censorship problems that silenced many teen voices, minority participation in student media was difficult. In the ‘90s, the Journalism Education Association was one of many groups focusing on the lack of diversity in its membership and also in their student staff populations. The board hosted two experts at its spring 1992 convention in Denver to conduct diversity training and help the group see the value of having a board that wasn’t all white. From that, the Multicultural Commission was launched in 1993 and its director was a voting member of the JEA board until Spring 2013 when long-time Commission Chair Norma Kneese resigned because of a move to teach in China. It’s hard to tell just how much that initiative accomplished. JEA’s Outreach Academy, which brings advisers to the National High School Journalism Convention, offers daylong sessions at each convention. According to the Chicago program,“The Outreach Academy is a free, intensive seminar for publication advisers who need help teaching and advising students in journalism while dealing with issues surrounding diversity.” Ten to 15 teachers usually attend this very practical, hands-on workshop to learn more about ensuring diversity in coverage. In the 2011 Scholastic Journalism Census, conducted by Kent State’s Center for Scholastic Journalism, the average school withoutstudent media has a 56 percent minority population; the average school withstudent media is 35 percent. As CSJ begins another census in 2019, the results will be telling. Is scholastic media like commercial media? ASNE’s annual survey of those newsrooms has shown an increase in racial diversity, but not one that compares to the changes in the U.S. population as a whole. As Cobb said in CJR’s “Missing the Story,” diversity matters now more than ever because of the “climate of unprecedented hostility” between the White House and the press, made possible, in part, because public trust in the media has decreased so much. “This is a crisis of democracy, since the press’s role as a guardian of democracy is founded upon the trust of the public,” Cobb concluded in her article. “But at least some portion of that distrust is a product of people who rarely see themselves or their stories depicted in the media they consume. A great deal must be done to rebuild public trust. But it can begin by including the voices of all Americans. The press, tasked with protecting American democracy, is best secured by reflecting the American people.” Continuing to offer support to these teachers after the convention they attend has often been the challenge. It can also begin with a renewed effort to attract those diverse faces and backgrounds to our high school media. It’s not going to be easy, but it can’t happen without our effort.